Some areas in the company are the logistically the perfect place to visually transmit information to employees, customers or guests, unfortunately the location does not have sufficient space for a blackboard or a wall stand system. Rotatable information pillars can solve the problem. Optimize your in house information and communication with VisuModul! 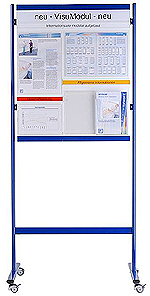 Your displays and postings for customer, visitors or staff members are professionally presented on clearly structred and neatly arranged notice board surface. The modular design provides multitude possibilities for individual configurations.